Your alleged breach of duty proximately caused bodily harm to the plaintiff. As you can see, a plaintiff in a premises liability case must meet a number of prerequisites to ultimately prevail. Each element can be challenged by your Brownsville premises liability defense attorney. In many cases, the notice element (i.e. element number 4) is the most challenging for a plaintiff to prove, especially if the alleged dangerous condition was a wet surface that could not be readily discerned by the naked eye. The Texas Supreme Court established that there are generally only three ways to prove actual or constructive notice on the part of the premises owner. Specifically, a plaintiff would need to show that the owner actually placed the dangerous substance on the premises, the owner possessed actual knowledge that the substance was on their premises and did nothing, or that it was more likely than not that the dangerous condition was in existence for a sufficient period of time to give the business owner an opportunity to discover it. Texas Courts have elaborated on these three factual prerequisites. 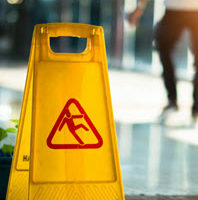 For example, if an employee of the business was simply in proximity to the alleged dangerous condition near the time of the slip and fall is considered to be inadequate for establishing constructive notice. Courts have held that if a plaintiff lacks evidence to show when or how a substance came to be on a business premise, or the length of time it had been there means a plaintiff cannot establish constructive notice thereby negating the fourth element. If this element cannot be proven, the plaintiff does not have a viable case. If a judge rules that you, as the business owner, lacked constructive or actual knowledge of the alleged dangerous substance, your attorney could then pursue a motion to dismiss the claim entirely. If your business is being subjected to a premises liability suit based on a slip and fall, you need to retain experienced and skilled counsel. The Brownsville defense legal team of Colvin, Saenz, Rodriguez & Kennamer L.L.P. is here to help. We possess decades of experience in this area of law. Contact our office today to schedule a meeting.